Follow this link to read an amusing encounter with the park's visiting Snowy Owl - photographs too. One of the issues around stormwater management in Sam Smith Park is the possibility of daylighting Jackson Creek, a buried creek that flows into and under the large swale near the Gatehouse. Uncovering the creek and allowing it to create a pond or wetland in the swale could provide a more naturalized solution that would enhance wildlife habitat and be a tremendous asset for our nature park. The buried Jackson Creek eventually flows into Rotary Park where it enters the lake. If this outflow were to be daylighted as part of the new design for this park, it would be an interesting natural feature there too. 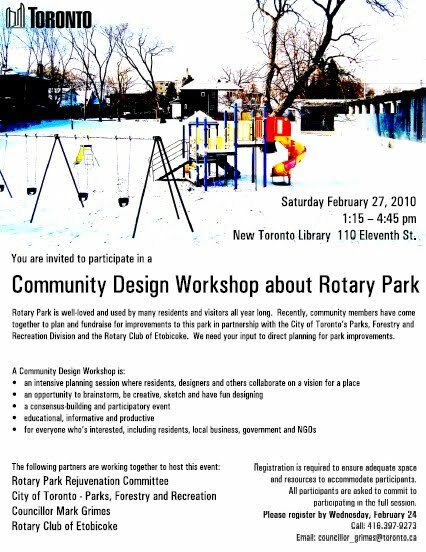 Please attend this community charrette and share your views. Dogs will soon run free in an area of Colonel Samuel Smith Park. City parks staff were expected this week to install off-leash signage in the 0.6-hectare run of open field to the east of the RL Clark Water Treatment Plant. Once the signs are in, the off-leash park is officially open. Dog owners Joanne Tobler and Maria Doyle proposed the off-leash area last summer to city parks officials. "It has been too cold. My dogs won't wear their boots," Tobler said, as she explained she had not been recently to the leash-free area of Sam Smith Park where she often walks her four dogs - a pug, pug-Shih Tzu cross, a Jack Russell-Corgi cross and a black Lab. Last week, city council approved 29 new off-leash dog parks. The dog parks join the city's 33 existing off-leash parks. The review of dog parks comes more than two years after council adopted the People, Dogs and Parks Off-leash Policy to deal with the growing conflict between dog owners and other park users. At a public consultation meeting in December, approximately 65 people, most dog owners, overwhelmingly supported south Etobicoke's two proposed off-leash parks - in Sam Smith Park, and a second 0.7-hectare area on the southwest arm of Humber Bay Park West. It was the largest turnout ever for a leash-free area proposal suitability assessed by the city, said Carol Cormier, city manager of parks, standards and innovation. Fencing emerged as dog owners' primary concern with both off-leash parks. Currently, a fence exists at the water plant site, Cormier said. City staff will review the off-leash park's fencing situation in spring to determine whether additional fencing is required, Cormier said. The Humber Bay Park West off-leash park is set to open in spring. At issue in that dog park is a fence. Toronto and Region Conservation Authority wants it fenced, citing the danger of strong lake currents in the area. Dog owners largely don't want a fence. Etobicoke's only other off-leash park remains open, but is threatened. The dog park in Don Russell Memorial Park is a proposed site for the installation of an $800,000 FIFA artificial turf soccer field donated by Maple Leaf Sports and Entertainment to adjacent Lakeshore Collegiate. Benches and garbage cans will be installed in both dog parks. City bylaw enforcement officers will regularly monitor both off-leash areas. City policy prohibits pit bulls, female dogs in heat and non-neutered males from off-leash areas. Last year, three applications for off-leash designation in Etobicoke were denied, citing proximity to wetlands and conflicting existing park uses at King's Mill Park (north of Bloor Street West), Michael Power Park and Grand Avenue Park.